There is a design pattern that I’ve noticed emerge on a lot of the responsive projects that I’ve worked on in the last few years. They have all tended to gravitate towards a particular kind of layout. There are a lot of situations where this pattern is helpful, so I wanted to write a bit about it. 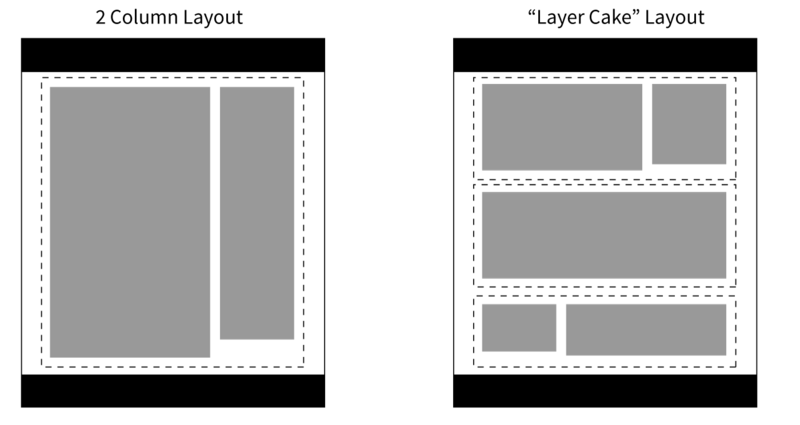 I call it “The Layer Cake” - it’s a way to approach page layout in a responsive design. You can also call it ‘tiered’ layout - but, mmmmm - cake. This differs from a regular ‘multi column’ layout in that there is no all-encompassing container, or long running sidebars. There can be multiple columns within a layer, though. The layers can all be swapped out, moved around, etc - easily. This makes for a layout that is easy to implement as part of a whole design system. Content source order must be considered carefully, as it enforces hierarchy. By avoiding sidebars, you can side step awkward content order problems that arise from a more traditional 2 or 3 column layout. Long form content will probably end up with large swaths of negative space next to it. I personally think this is a strength that aids in the readability of content, but this could be perceived as a drawback. They tend to end up forming long pages with a lot of scrolling. I personally don’t mind this - I think users are by and large comfortable with scrolling. “Related” content pieces are harder to present ‘right next to’ a main piece of content. Maintaining a consistent layout involves a bit more planning and manual adjustment. Have you used this design pattern? What worked well for you? What didn’t? Let me know with a comment!